This is a list of games that I have been able to get, that took a lot of work to get. Only one of them is what I would consider a "Grail" game. These are ones that I mostly thought would be difficult to get because they were rare or had higher price tags than I was willing to pay. A few are ones that are now costly and I stumbled on to by dumb luck. This is the one that inspired the list. I just got it today. I read the comics for about 35 years (until the horrific Brand New Day storyline finally broke my will). My children are now reading my old comics and playing with my old toys. I've had my eye on this one for a few years, but it has been VERY hard to get. See for yourself. Only 124 BGGers own it. Only 11 have it for trade. Of those, only 2 live in the states and they haven't been logged on for years. It's not the kind of game that is going to fetch hundreds, so I don't really want to pay overseas shipping. I set up an automated E-Bay search (you should have seen the number of filters I put in that search just to keep it from flooding my inbox with 50 new items per day). It showed up once and I got sniped in the last few seconds. Arrrrgh! It was practically in my hands! I tried to buy it off of folks who rated it lowly, but see for yourself: all overseas. I finally found a wargamer (art1066) who had it rated a 5, but didn't have it listed for trade. I offered him a trade for one of the items on his wishlist. He turned that down, but offered to sell it for $35 + shipping. Cha-Ching! This was my first "tough to get" game. When I discovered BGG in 2008 and was getting into the American Revolution, this was the highest rated game on the topic. I tried and tried to get it, but I lost every Ebay bid. I finally got lucky and got it for about $85, which is the most I ever paid for a game, but back then, they were going for closer to $100. It was everything I was hoping it would be and then some...until it was re-implemented as Washington's War 2 years later. That's ok, because Washington's War took an awesome, awesome game and made it perfect, and We the People it introduced me to the wonderful world of card driven games. A 30-year old game. Long out of print. Only 58 BGGers have this listed as owned. EBay searches showed nothing. I really didn't think this was ever going to happen. Then I created a Geeklist to help hook up wargamers with out-of-print games. I listed this and ScottH came through and it only cost me $20. This is as good as I hoped it would be. I'm close to finishing a Vassal module for it. This is a solitaire magazine game from 1986. Another one that has been hard to get. The trades weren't right and it wasn't showing up on EBay. I posted it to that geeklist and my Vassal buddy Pete traded me for a magazine game. Added bonus: since he's from Australia (shipping wasn't that much), I got some cool stamps on the envelope to give to my children. After I played Saratoga, I liked it so much that I wanted to play the other games in the Battles of the American Revolution series. This was on GMT's P-500 list and I signed up. I soon realized that it moves so slowly on the list that it will pass the P500 about 10 days after the sun burns out. I was pricing it back then, and it was going for about $70 on EBay, so I was tickled pink when I saw it pop up with a "Buy it now" for $35. And it was as good as I thought it would be. Like Brandywine above, this is the only other game in the Battles of the American Revolution series that was out-of-print. It, too, was also on the GMT P-500 list and going nowhere. And again, I got another expensive game from the same seller with a $35 "Buy it now" price. Except in the case of this one, I saw it a few months later at a FLGS in Illinois. That's the only other time I saw it, but it still doesn't feel quite like the accomplishment that Brandywine does. I had my eye on this one a couple of years ago. It was never a hot priority, but I did have it on the wishlist. Every time I was on Coolstuff I noticed they never had it, but didn't think twice about it. Then someone on the wargame forum posted that it has been out-of-print for awhile (I didn't know that) and that the publisher had a few copies of it left, so I ordered one that day and didn't realize just how lucky I was. It really is an awesome game and was highly sought after. It's not quite in demand as it was since it was recently reprinted, but for about 18 months, I realize that dumb luck had smiled on me. I played this at game night about 3 years ago. I have a rule: add dinosaurs to any game and that game gets cooler by at least an order of magnitude. I don't care what the setting is: the moon, ancient Rome, WWII: dinosaurs make everything better. I don't really go for Euros, but throw in some dinosaurs, and I'm all over that. Problem was, when I played it, it had been long out of print and going for about $90. Fortunately, it was reprinted, which drove down the price some. However, I wanted the 1st edition (shown) with the goofy artwork. I got lucky when I saw it on the marketplace for $50 and jumped on it. My wife was looking for Valentine's Day ideas for me a couple of years ago. We stopped by the FLGS and I pointed to the Memoir '44: Mediterranean Theater expansion, so she grabbed it. She asked if I had everything else. I pointed at the Campaign Book and said that was the only thing there I didn't have and that I might get it someday. She grabbed it. I objected ("you're spending too much"). I'm glad she didn't listen. About a year later, I saw 3 of them on the Marketplace going for over $100 each. I thought, "Good luck getting that out of that book." It turns out that wasn't unreasonable. Whew! Best of all, the Campaign book is a blast to play! I heard this one talked about a lot about 3 years ago. It had gone out of print when I decided to get it and the prices took off. Fortunately, I caught it as it was taking off and nabbed a new copy off of EBay for $60, which was about $30 less than the going price at the time. Amazingly, it still hasn't been re-printed, so I thank my lucky stars that I got it when I did. It is one of my handful of '10' rated games and a fixture in my top 10. Then, he took posterboard and created another field with a different layout. Then he created Yankees stadium (yay!) and Fenway Park (boo!) and I played the heck out of all these games. During the 2000s, I checked for this on EBay periodically, and had no luck. Then, when Ebay created the e-mail alert, I set up an alert for this. After months, one popped up for $1000. I contacted Dad and he said "too much" (I concur). It was rare, though, as only one user on BGG had it listed as "owned." A few weeks later, a beat up copy showed up and I contacted Dad again, he said to offer $500 (he doesn't do internet purchases, so I was acting as liaison), and it happened. The box was a mess and the board was well used, but the dream became reality. Not content with that, Dad contacted a guy in town who manufacturers boxes and he had a couple of perfect replicas created. Then, he had a couple of replica game boards created, and got some replica game pieces created. With that, he gave me the original and one of the replicas. Now, we both get to relive our respective childhoods! This is certainly the RAREST game I own. I am now one of 2 people in the BGG database to have this game marked as "owned." My buddy Barteus introduced me to this one. It's a great little pocket game, but it's long out of print (30 years) and it's rare (49 BGG Owners, 2 for trade). I put up an EBay search and got lucky when I got it and Hot Spot (a game I already owned, but used as trade bait) for $10. I had $30 as max bid and just knew I was going to get sniped. I rolled 6's that day. Mistermarino introduced me to this at game night, and back then, he would introduce me to great games, and I would have to run out and acquire them. This was no different. 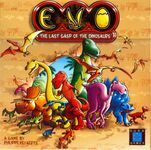 This one is hard to find (75 BGG users), and it's on the market place currently for $90 (Canadian dollars). Nothing showed up on EBay, so I went to the ratings and found Cobame had it rated lowly and offered to buy it and he sold it for $30. It's a funky little game with some clever mechanics. There are 6 different CRTs (Combat Results Table). The Martian player chooses one and puts the other 5 back. When the English player fires weapons in combos, he rolls the die, the Martian player secretly consults the table and tells him if it hit or not, so the English player has no idea which weapons and which combos work and which ones don't for a long time. I feel ashamed that I had not heard of this until late in 2013, but once I did, I wanted it. It was something of a grail game, but when the designer (his epicness, Mark Herman) learned that I was looking for it, he sent me copy...because he's just that awesome. And yeah buddy, this game was worth the wait. One of the best solitaire games out there. I spent years longing after this one. My father gave me some birthday money and told me to get one of those hard to find games that I speak of on those (Dice Tower HAMTAG) videos. This seemed quite appropriate, since he was in the 82nd Airborne, though long after Market Garden. I enjoy Memoir 44's Overlord scenarios, that I wanted to try it in this system, which I think is the best of the Command & Colors-type of games, but I didn't like the $90+ it was going for. I got some birthday money in 2014 and decided to look this up and got it for about half that. It appears the price is soaring on this, so I got really lucky with that. It's obtainable, but it's going to cost you. Finding the balance of cost vs. what it's worth to you is the trick, and I got that at BGG Con in 2014 when I get this gem for $39. Worth it. Brilliant design. Sadly, right after I got it, another one with the expansion went for $49. D'OH! Oh well, don't look those gift horses in the mouth. But someday...that expansion will be mine. Oh yes...it will be mine. And then it will be on this list. After playing Glory III, I wanted to grab the other two games in the series, because this is a really solid system. But the other two were out of print and expensive. I kind of gave up on getting them and then I got really lucky and traded for it in the 2014 BGGCon Math Trade. After I got Glory, I got really interested in this, but the automated EBay searches kept showing up at $90 and I didn't want to pay that. On Facebook's Wargame Marketplace, one of my FB friends asked if somebody had a copy of Guilford to sell or trade. I looked through his collection and saw this. I figured he'd never go for it, but I asked if he'd be interested in trading this. He was. Then, I had to spend a day thinking about it, since Guilford is on this list. It's not easy to find, but after all these years, I think it's the weakest game in that series that I own (Saratoga, Brandywine, Monmouth, and Germantown), and just isn't going to get played. Since the guy is my FB friend, I warned him that Guilford's rules restrict the skirmishing units and as a result, poorly models their effectiveness, but he still wanted the trade, so I took it. Now, I have them all! I've been trying to get this for years. It either cost too much or I just couldn't work out a trade. I hoped for the Kickstarter campaign to succeed, not because I backed it (I did not), but because I was going to use that to buy up an original copy for a song. My Geekbuddy Dan sent me this along with the Banzai and Desert War expansion for free for helping him playtest his amazing game Hands in the Sea. I accidentally learned of this one and then it became a grail game. I decided to make a big run at it and sold a bunch of wargames on Facebook's Wargamer's Marketplace, and used my winnings to buy this for $150 + shipping (and that was a good price for this game). My Ameritrash mentor has most of the heavy hitting / hard to find games in that genre, but the dinosaur game I listed earlier and this escape him. I got some birthday money and decided since I'm getting pickier about wargames (I got a solid collection that makes me happy), I might as well go for a grail-type of game, so I grabbed this one for $100, which was a little better than it was going for elsewhere.